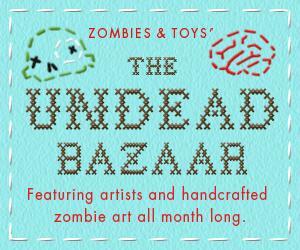 Georgia Dunn Studio: The Undead Bazaar! I just finished my interview for Zombies & Toys for their upcoming 'Undead Bazaar'. I tried my very hardest not to sound like a total weirdo (rest assured, I still probably sounded like a total weirdo). They sent me some banners to use in this blog when the interview and the giveaway contest are in full swing, and I just have to share them now, especially the third one. Imagine me looking these over: "Cute, good information. Nice design...."
"Aw, that's really cute. I like the slogan." I can't wait until the time comes and I can actually post these on the blog with links to the Undead Bazaar! Dude. The second one is so cute. Isn't it? They've done such a good job with these!